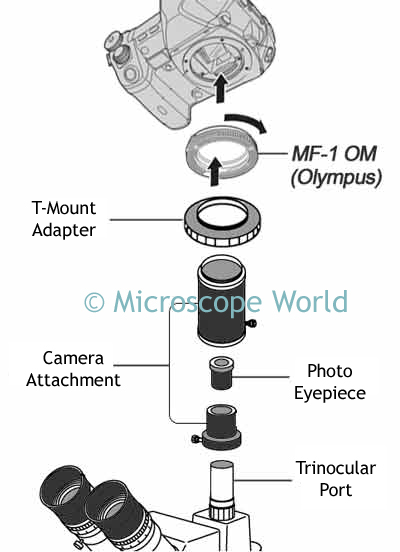 Connecting an SLR or digital SLR camera to a microscope is a fairly simple process that requires the use of a T-Mount adapter (also referred to as a T-ring). Each brand of microscope has a slightly different way that the camera connects to the trinocular port, but below is an illustration that shows the process used for the Meiji microscopes. If you have any lenses on your SLR camera you will want to remove them. Each brand of SLR camera has a different specific T-Mount adapter that is made for the brand. You will need the correct brand-specific T-mount. For example, if you are using a Nikon SLR camera, you need to use the corresponding Nikon T-Mount. There are several Olympus cameras that require an additional part called the MF-1 OM. You can view a list here to see if your Olympus camera is one that requires this piece. The T-mount adapter bayonette mounts onto the body of the SLR camera and then threads directly on to the camera attachment. The camera attachment is a microscope specific part that connects the threads from your T-mount and securely attaches the camera setup to the trinocular port on the microscope. Finally, there is typically a photo eyepiece that must be placed inside the camera attachment. Remember that when you look through the microscope you are looking through magnified eyepieces. Similarly, the camera also needs to view some magnification so that the image your camera captures will closely match up to the magnification viewed through the microscope eyepieces. Keep in mind that because the SLR camera already provides a bit of magnification based on the chip size in the camera, the magnification of the photo eyepiece will not be identical to your microscope eyepieces. For example, when using 10x eyepieces in the microscope, you might use a 2.5x photo eyepiece in order to get the same magnification at the camera. You can find more information about the SLR camera parts required for a Meiji microscope here.